The Blairs and the entire Silver Spring area have a rich and interesting history dating back to the mid 1800’s. Discover the background of Silver Spring, the people who put it on the map, and the events that took place on this land we call The Blairs. Enjoy this journey through history. The Blair family was one of the nation's most prominent political dynasties from the 1820s to the 1860s and beyond. The Tower Companies' Blair complex is built on a small section of the approximately 1,000 acres in Maryland and the neighboring District of Columbia purchased by family patriarch Francis Preston Blair in the early 1840s for use as his country estate. Francis Preston Blair was a journalist, editor, and an influential figure in national politics advising several presidents across party lines. He was an early member of the Democratic Party and a strong supporter of President Andrew Jackson in 1828. He moved from Kentucky to Washington, D.C. at Jackson's request to run the Washington Globe newspaper and be a member of Jackson's “kitchen cabinet.” Despite being a slaveholder, Blair eventually came to oppose the expansion of slavery into the western territories. In the 1848 election, he supported the Free-Soil Party ticket of Martin Van Buren, which was also against the expansion of slave territory. In 1854, because of his opposition to the Kansas-Nebraska Act, which could have expanded slavery to these new territories and resulted in the “Bleeding Kansas” atrocities before the Civil War, he left the Democratic Party and helped establish the Republican Party. Blair served as an adviser to Abraham Lincoln during the Civil War. In 1861, he was sent by Lincoln to offer command of the Union Army to Colonel Robert E. Lee. When Virginia seceded the next day, Lee professed loyalty to Virginia rather than the Union and joined the Confederacy. In January 1865, he engaged in “shuttle diplomacy” between Lincoln and Confederate President Jefferson Davis. These efforts led to the Hampton Roads Conference of 1865, a failed attempt to negotiate an end to the Civil War that resulted only in an exchange of prisoners of war. With the ascendancy of the radical Reconstructionist faction at the end of the Civil War, Blair rejoined the Democratic Party. Francis Preston Blair’s son, Montgomery Blair, joined Lincoln’s cabinet in 1861 as Postmaster General and is credited with establishing free delivery of mail in cities, founding the Universal Postal Union, and other postal innovations such as standardizing international postal rates and services, money orders, and railway postal cars. Another son, Francis Preston Blair, Jr. was a Missouri Congressman, brigadier general during the Civil War, and the Democratic nominee for vice-president in the 1868 presidential election won by Republican Ulysses S. Grant. A grandson, Francis Preston Blair Lee, became Maryland's first popularly elected Senator – and the first popularly elected Senator from any state – in 1914. A great-great grandson, Francis Preston Blair Lee III, was Lieutenant Governor of Maryland from 1971 to 1979 and acting Governor from 1977 to 1979. 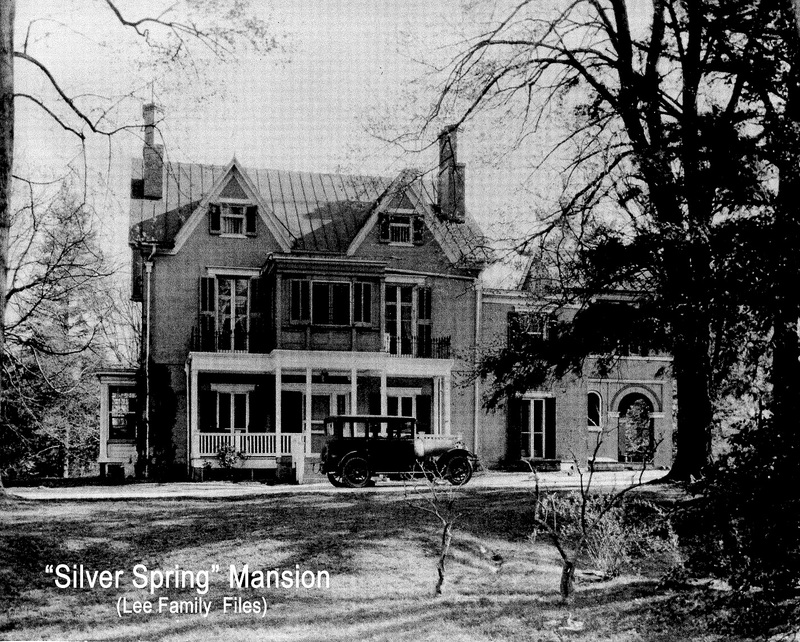 Silver Spring, Maryland took its name from Francis Preston Blair’s "Silver Spring" mansion. Francis Preston Blair began looking for a location to build a summer home after he moved to Washington and purchased (in 1836) the home now known as Blair House, the presidential guest house at 1651 Pennsylvania Avenue. Friends advised him that if he went up the 7th Street Pike (today’s Georgia Avenue) north into Maryland, he would be at a high enough elevation to escape the heat of Washington in the summer time. Legend has it that in 1840 during Blair’s exploration of the area near the District of Columbia/Maryland border, something startled his steed, Selim, which ran off leaving Blair and his daughter Elizabeth behind. They found Selim lapping water at a spring. “And Blair said that there was sand in this water that had mica flakes, which are metallic. And when the sun struck the water, it sparkled like silver. A silver spring.” Blair was so taken with the spring and surrounding land that he bought the approximately 1,000 acre parcel that included the spring. The spring, which no longer has a natural flow but instead is watered by the WSSC, is now encased with marble and is next to the “Acorn” gazebo (built by Blair) in the small park at Newell Street and East-West Highway. Blair also built his summer home called “Silver Spring” near the spring. The Blair family built three country homes on his estate. In addition to his own “Silver Spring”, there was "Falkland" (where The Tower Companies’ Blair complex is now) built for his son Montgomery Blair, and “The Moorings" built for his son James, a naval officer who died in 1853. “The Moorings” was later occupied by his daughter Elizabeth and her husband U.S. Navy Rear Admiral Samuel Phillips Lee. Only "The Moorings" (now much altered) still exists. It is in Jesup Blair Park, east of Georgia Avenue just north of the District of Columbia border. 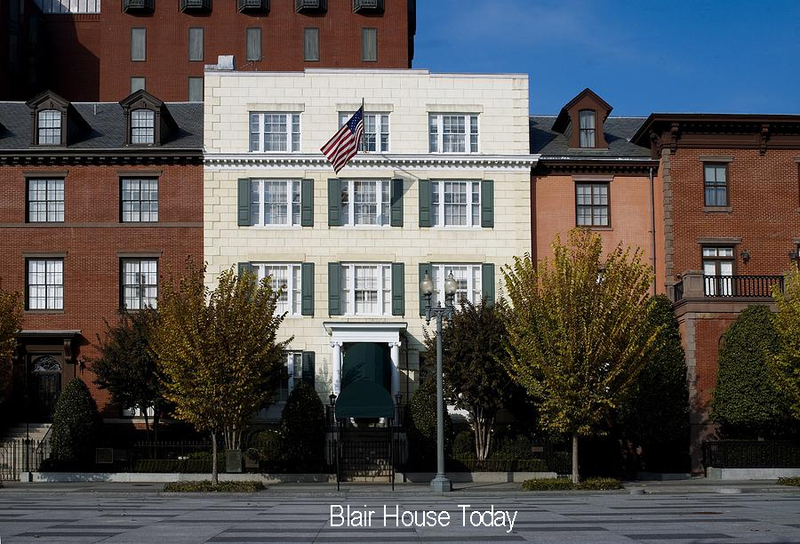 Within a few years of its construction, Blair moved full time to his “Silver Spring” mansion. He had many notable visitors over the years including Vice-President John C. Breckinridge, who was a Blair family relative, and President Abraham Lincoln. One of Breckinridge's visits came in 1864 while he was a general in Jubal Early’s Confederate army attacking Washington. 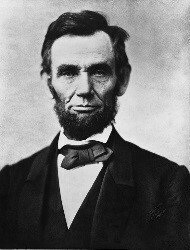 Lincoln is reputed to have played an early version of baseball while visiting “Silver Spring.” In addition, the call for the first Republican convention was written in the home's library. 1632 – King Charles I grants Maryland to Lord Baltimore. Charles County includes the land which would become Silver Spring. 1688 – Land Grant of “the Girls Portion” to Henry Darnall. This land grant contains all of what is now downtown Silver Spring south of Colesville Road, the northern part of Takoma Park, and parts of the District of Columbia. 1695 – Charles County divided. The new Prince George’s County includes the area which would become Silver Spring. 1732 – Land Grant by Lord Baltimore, the Lord Protector of Maryland of “Labyrinth” to William Beal, James Beal, and James Edmondson. The “Labyrinth” land grant encompasses most of the close-in Silver Spring north of Colesville Road to University Boulevard in Wheaton. Narrow portions of the land grant extend west to what is now Bethesda and into the District of Columbia. 1745 – Prince George’s County divided. The area which will become Silver Spring becomes part of the new Frederick County. 1776 - Montgomery County is created from the southern portion of Frederick County on October 1, 1776. 1816 – The short-lived “Simpsonville” post office is established. 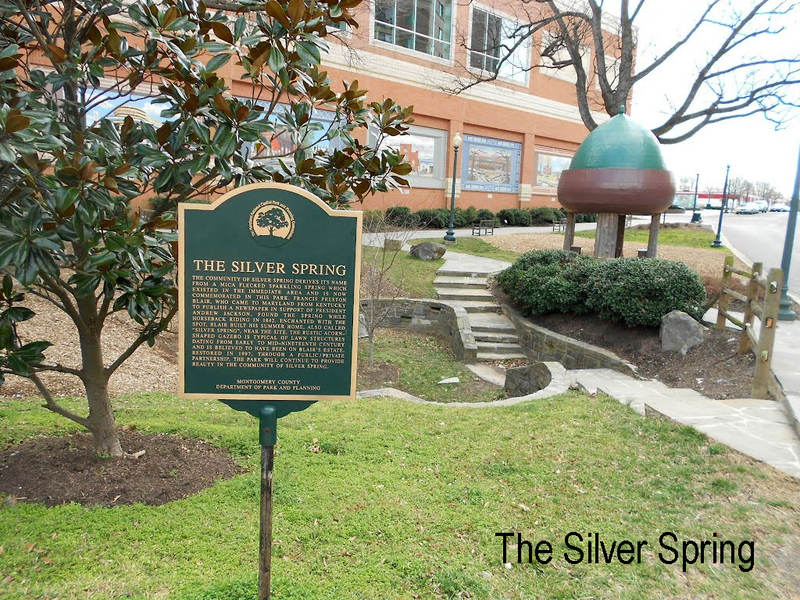 1840 – Francis Preston Blair, his daughter Elizabeth, along with their thirsty horse, Selim, discovered the spring, after which Silver Spring takes its name. Sparkling flakes of mica in the water give it the appearance of silver. 1840s - 1850s –Francis Preston Blair became disgruntled with the Democratic party and then supported the Free-Soil party before helping to organize the Republican Party, in which Lincoln became a member. 1842 – Francis Preston Blair built “Silver Spring”, a 20-room 3-story home (on the southeast corner of the current intersection of Newell and Kennett Streets). 1849 – Union Turnpike Co. chartered to construct a road (now Georgia Avenue) from Brookville, MD to Washington D.C. through part of Blair's “Silver Spring” estate and adjacent to other parts. 1850s – Francis Preston Blair commissions Benjamin King, a carpenter living in North Takoma in D.C., to build the acorn gazebo still standing in Acorn Park. He had it designed in the shape of a giant upturned acorn because according to the Blair family history, he had proposed marriage to Eliza Gist under an oak tree. Many luminaries came and sat beneath this gazebo, including President Lincoln. 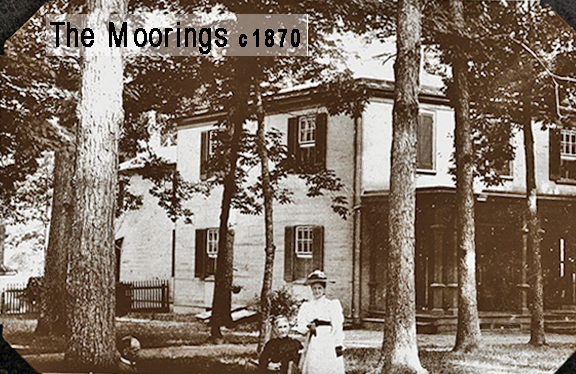 1850 – “The Moorings” was built for Francis Preston Blair’s naval officer son, James Blair, who died in 1853. 1854 – Montgomery Blair, son of Francis Preston Blair, moves to Silver Spring at “Falkland” (current location of the Blair Shopping Center). At the time, he represented Dred Scott in a notorious case before the U.S. Supreme Court. Built on a tree-covered hill, the front entrance faced north towards the present day intersection of Colesville Road and East-West Highway. 1857 – Francis Preston Blair's grandson Francis Preston Blair Lee was born to Elizabeth Blair and Samuel Phillips Lee. He was raised in Silver Spring and later became Maryland's first popularly elected U.S. Senator, serving 1914-1917. 1860s – Public education begins in Montgomery County. The two-room Sligo School opens on a site that would later become the Hecht Company and then Ellsworth Place Mall. 1861 – Francis Preston Blair opens the first Silver Spring post office. The name is changed to Sligo two years later. The area near the intersection of Colesville Road and Georgia Avenue is identified as Sligo on State Roads Highway Commission maps as late as 1958. 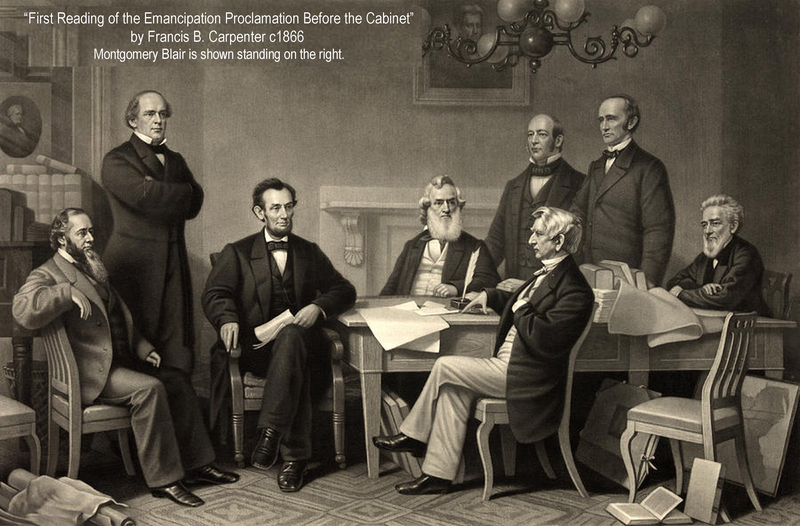 1861 – Francis Preston Blair was sent by President Lincoln to offer command of the Union Army to Colonel Robert E. Lee, who declined and instead joined the Confederacy. 1861 - 1864 – Montgomery Blair serves in Lincoln’s cabinet as Postmaster General and is credited with founding the Universal Postal Union, an agreement between nations which standardized international postal rates and services. Blair also originated free delivery in cities, money orders, and railway postal cars. 1861 – 1865 - Civil War. Silver Spring is occupied by Union troops. 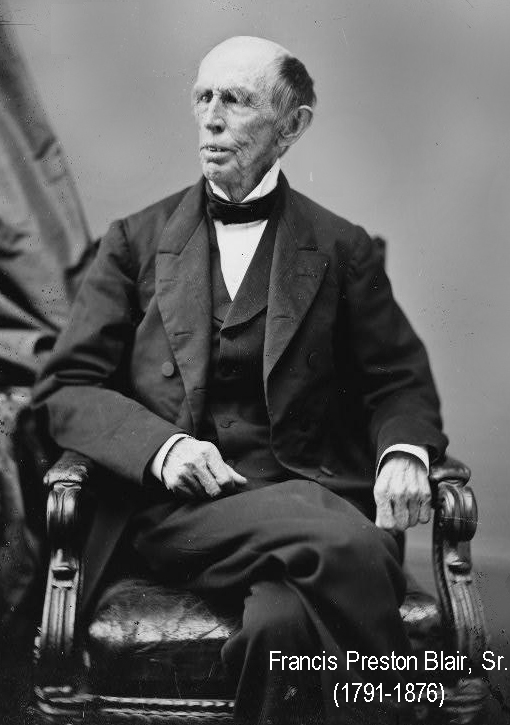 1864 – Francis Preston Blair unsuccessfully lobbied Lincoln to appoint Montgomery Blair to be Chief Justice of the United States. 1864 – While Francis Preston Blair and Montgomery Blair were on a fishing and hunting trip in Pennsylvania, and the family women and young Francis Preston Blair Lee were vacationing in Cape May, N.J., “Silver Spring” was occupied by Confederate Jubal Early’s troops prior to the Battle of Ft. Stevens in Washington D.C. Only the prompt arrival of General Early, and Confederate General and Blair cousin John C. Breckinridge, ended looting and prevented the home from being burned. 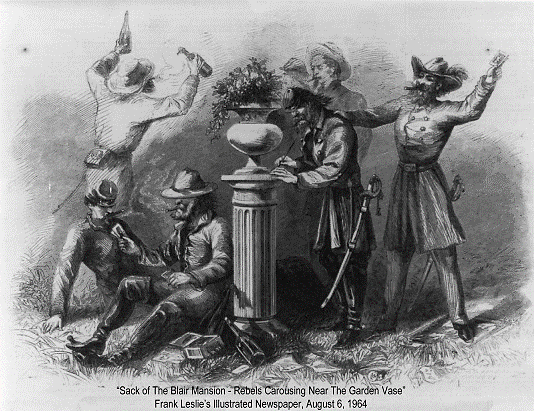 The looting of Blair's wine cellar gained national attention with a drawing in Frank Leslie's Illustrated Newspaper. Postmaster General Montgomery Blair’s home “Falkland” was burned to the ground, reportedly by Confederate stragglers as Early's forces retreated. It was promptly rebuilt in 1865 and, as the war ended, it was the site of Montgomery Blair's “strawberry party” for his brother, Major General Francis Preston Blair, Jr., and the staff officers of Blair's Seventeenth Corps. This was reported as the last Civil War event in Silver Spring involving the union army. 1865 – Francis Preston Blair engages in “shuttle diplomacy” to Richmond to see if he could initiate peace talks with Confederate President Jefferson Davis. In total, Mr. Blair served as the unofficial advisor for 12 U.S. presidents. 1868 – Francis Preston Blair, Jr., youngest child of Eliza and Francis Preston Blair, is the Democratic vice-presidential Candidate. The ticket was defeated by Ulysses S. Grant. 1920s – In the late 1920s, a descendant of Blair, Colonel E. Brook Lee, a power in Montgomery County politics, arranged for construction of East- West Highway to connect downtown Bethesda to downtown Silver Spring. Reportedly, the route took many twists and turns to ensure it touched on various Lee holdings. During road construction “dynamite collapsed the underground strata of stone, and it cut off the underground supply of spring water” to the spring with sparkling mica chips discovered by Francis Preston Blair. The WSSC began piping water to maintain a flow at the spring site. 1934 - “The Moorings” was renovated for use as the Silver Spring Library. The home and its 16 acre site had been donated to the State of Maryland on the death of Violet Blair Janin. “The Moorings” served as the library until 1957. During the Vietnam War, it was the headquarters of the local draft board. 1954 – Francis Preston Blair's “Silver Spring” mansion was demolished. Somewhat fittingly, for many years the site served as a Post Office branch. 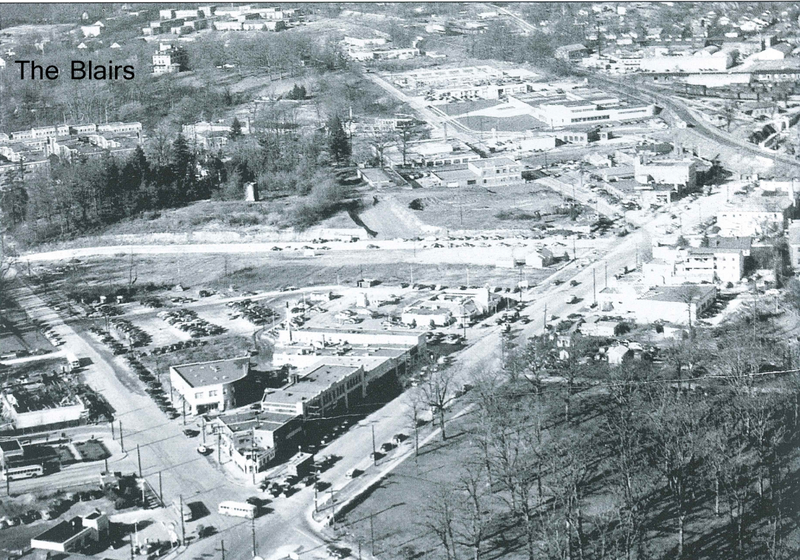 1958 – To clear the land for development of the shopping center and residential complex that is now the Tower Companies' "Blairs", Montgomery Blair's “Falkland” was burned down in a controlled fire by the Silver Spring Volunteer Fire Department. A special thanks to Robert E. Oshel, PhD for his research, guidance and invaluable contribution..